Full Vapor ™ ~ E-Cigarette Reviews, Ratings & News! : V2 Cigs Launches Vapor Couture, E-cigarettes Designed Exclusively For Women! 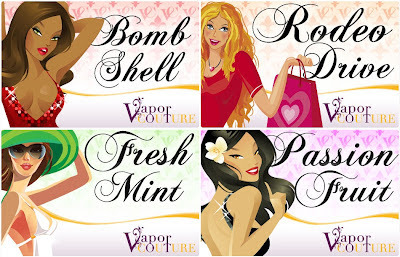 V2 Cigs Launches Vapor Couture, E-cigarettes Designed Exclusively For Women! This week V2 Cigs launched its much-anticipated Vapor Couture line of e-cigarettes. What is Vapor Couture? Vapor Couture is a unique line of e-cigarettes and high-fashion accessories that are designed exclusively for women! Check out Vapor Couture by clicking the Vapor Couture logo below! "It is a unique line of electronic cigarette that combines the technology of V2 Cigs with elegant designs and stylish accessories. Our unique flavor cartridges can be customized to mix and match with any of our jewel-tipped, rechargeable e-cig batteries." E-cigarettes Made Exclusively for Women! The Vapor Couture products are designed exclusively for women, and perfectly compliment all the latest fashion trends. Vapor Couture offers a selection of ultra-thin e-cig batteries that coordinate wonderfully with the various Vapor Couture accessories. All Vapor Couture batteries come in your choice of brushed platinum, deep metallic purple, rose gold or the VC signature white logo pattern. Each e-cig battery is finished with a sparkling crystal tip and a matching LED light that sparkles and glows with each puff. 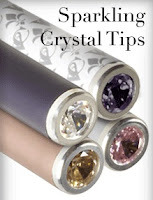 • The deep metallic purple battery comes with a white faceted crystal tip. • The brushed platinum battery comes with a purple crystal tip. • The rose gold battery comes with a gold jewel tip. • TheVC signature white battery comes with a purple jewel tip. • VC Clutch - a contemporary carrying case that includes a detachable wristlet handle. The inside has several compartments to hold your batteries, flavor cartridges and Vapor Couture charger. It also comes with an extra-long mirror and an exterior pocket (for credit cards, etc.) with a magnetic closure. • VC Bracelet and Charm - With the bracelet and charm, you can slip your e-cig battery in the charm to keep it dangling at your wrist, or to carry an extra e-cig flavor cartridge. The stylish woven bracelet is available in 4 colors (metallic purple, dark silver, metallic pink and black). • VC Lanyard and Charm - Show off your style, while keeping your e-cigarette safe and handy around your neck with the lanyard and charm. Each lanyard comes in beautifully braided leatherette with a colorful finish. You can stick your e-cig battery in the charm for safe and fashionable travel while you're out and about. • VC Charm - The charm accessory attaches to your e-cigarette or flavor cartridge, so they're handy whenever you want to vape! The VC Charm comes with a lobster clasp that you can attach to your own bracelet, necklace, key chain, etc. • VC Charger and Car Adapter - Keep your e-cigarette battery fully charged at all times with the charger and car adapter. This set of power charging devices includes the Mini Charger, which plugs into any USB port, the Wall Adapter (for home or office) and the Car Adapter (for charging on the go). An internal chip automatically shuts off charging to prevent damaging your e-cig batteries, and an indicator light lights up when your e-cig battery is fully charged. The Wall Adapter is available in USA, UK and EU models. Other available Vapor Couture accessories are the VC Charger Kit (the Wall Adapter and the Mini Charger) and the VC Car Adapter. • Rodeo Drive - Like its name suggests, the Rodeo Drive cartridge flavor embodies American elegance. It's a hearty tobacco blend that is perfect for anyone who loves the taste of classic American tobacco. Get it in a color that corresponds to your battery, or mix and match to show off your own individual style. It comes in 4 nicotine strength choices: zero (no nicotine), light (0.6%), medium (1.2%) and full (1.8%). • Fresh Mint - a delicious menthol flavor, perfect for those who enjoy the yummy, minty freshness of menthol. You can get it in each of the four Vapor Couture battery colors. It, too, comes in 4 nicotine strength choices: zero (no nicotine), light (0.6%), medium (1.2%) and full (1.8%). • Passion Fruit - Like sweet things? The Passion Fruit flavor is a fun, fruity tropical flavor. Perfect for summer time! Like the previous Vapor Couture cartridge flavors, you can get it in the color that matches your Vapor Couture battery, or mix and match to show off your own personal, creative style. It also comes in 4 nicotine strength choices: zero (no nicotine), light (0.6%), medium (1.2%) and full (1.8%). Overall, I must say that V2 Cigs really did an awesome job with their Vapor Couture line. The entire product line seems to be extremely well-designed, and very deserving of the "couture" label. The products are, indeed, highly fashionable and custom-made, just like the word itself demands. From the crystal-tipped batteries, to the extremely pretty bracelets and charms, Vapor Couture is sure to please and impress all those who gaze upon them. And just as importantly, Vapor Couture is owned and operated by V2 Cigs, the most-trusted and enjoyed e-cigarette maker today. So you can be 100% sure that you're getting top-notch quality and dependability. Interested in checking out the entire Vapor Couture lineup of highly stylish e-cigarettes and accessories? Just follow the Vapor Couture banner below! Get a 10% Discount On All Your E-cig Purchases! Did you know? You can get 10% off ALL your V2 Cigs and Vapor Couture purchases with the new V2 summer coupon code "v2save10." For more on the V2 Cigs summer coupon code, go here. Vapor Couture is by far my favorite...(and I've tried lots of different e-cigarettes in the last year). They're just so beautiful and classy. And their flavors are really yummy (love the passion fruit and the fresh mint!). Thanks, and sorry for rambling...I'm just happy happy happy and wanted to share it lol!